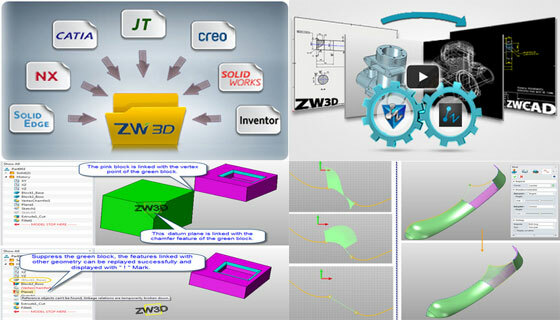 ZW3D, the most recognized solution provider in top-notch cad/cam application, just launched ZW3D 2014 SP. This latest cad/cam application comes up with in excess of 300 enhancements in CAD and CAM modules, which empower the users to design with unmatched quality as well as machine in a quickest possible way. The advanced features include improved file translator to support data interoperability via JT files, new part family to speed up the design of parts variations, new “ Open in ZWCAD” feature to control specialized DWG functions and various superior modeling tools to produce interactive design atmosphere. This newest version of ZW3D is specifically designed for enhancing the CAM functionality with some exclusive features like automatic corner finishing, wave tool path for stone polishing and easier hole machining on 2D drawings etc. With ZW3D 2014 SP, the consistency of machine, life span of tool as well as effectiveness of CNC are enhanced to a great extent. ZW3D 2014 SP comes up with different 11 languages ranging from English, Spanish, and Portuguese. The Italian and Japanese versions will be available very soon.